Vasily Polenov became famous as a master of landscape genre. The painting “The Old Mill” is a vivid example of the creative genius of the artist. The mill is the compositional center of the picture. It is to her, first of all, that the viewers direct their eyes. It creates the impression of fatigue and gentle thoughtfulness. The logs of the structure were blackened by moisture and damp, and the roof had long since fallen off from heavy rains. In Russia there was a belief that all the mills are under the auspices of evil forces. 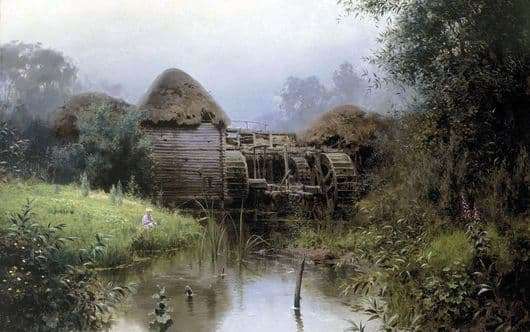 It is not known whether Polenov used this peasant belief, but he gave a very clear idea of ​​how a neglected building should look. The mill fits perfectly into the surrounding reality, it stands against the backdrop of a misty forest, the river slowly flows near steep banks. The picture embodies the calmness of pre-dawn peace. Nature froze in anticipation of the dawn. As soon as the sun rises, the fog will dissipate – a new day will come. Most likely, the work was written in the summer. Everything blooms and breathes the elusive warmth of summer dawn. On the street there is still a light fog that envelops the river and the nearby nature. On the shore sits a boy. He has been fishing for a long time, at the same time he came to visit his good friend. The mill used to help people, but now it has grown old and has fallen into disrepair. Nature slumbers on the mirror smooth surface of the river, the mill sleeps lightly. As soon as the first rays of dawn appear on the horizon, the river will wake up, come to its senses and run faster, far into the distance. Then the mill will spin, but no one needs its help anymore. So, she and turns from dawn to dusk.